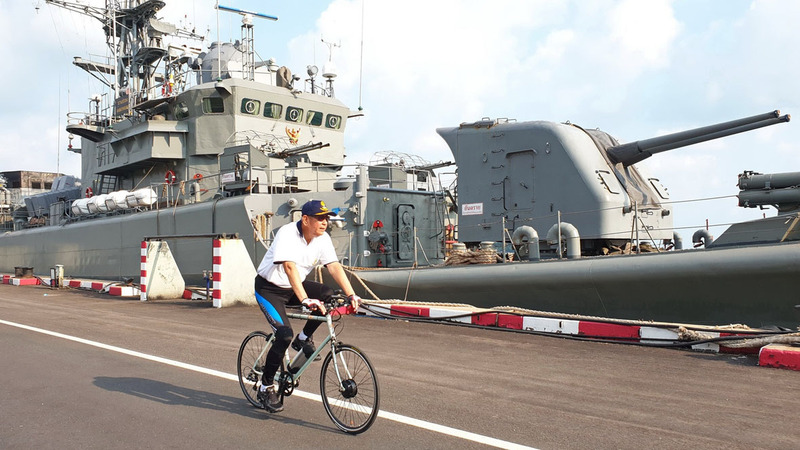 Adm. Noppadol Supakorn rides past part of his fleet to prepare for the second leg of the navy triathlon. The commander of the Royal Thai Fleet took his officers on a 10-kilometer bike ride to prepare for the second leg of the navy triathlon. Adm. Noppadol Supakorn was joined by officers and rank-and-file soldiers in the Feb. 26 trek from the Sattahip Port, around naval facilities and ending at Laem Tien Pier at the Sattahip Naval Base. Navy policy dictates that sailors exercise and stay in shape. To that end, the service is running a year-long series of triathlons, the second of which took place March 2 in Chiang Rai.